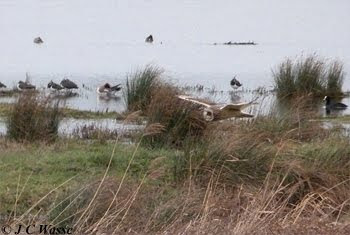 Birding highlights this Saturday just gone included connecting with a Bar-tailed Godwit roosting with Lapwings on the Target Pools at Rainham Marshes RSPB, a stunning Short-eared Owl patrolling the area between the hide and the pools with a Red Kite heading west over the tip. A good variety of species seen and double figures of Stonechat was certainly noteworthy, as was a Ruff playing hide and seek amongst the throng of Dunlin, Lapwing and Golden Plover. Water Pipits continue to be showy this winter, they will look good come March, as should their Scandinavian Rock Pipits cousins should they linger on the Thames shore. The Raven pair were pair bonding and throwing their weight around. Would have liked to have seen the Merlin and Bittern, can't have them all, but it shows the cracking variety of this excellent reserve. 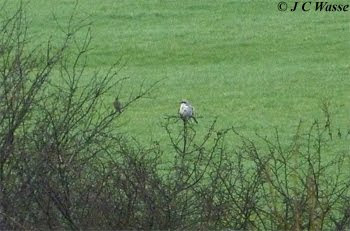 Twitched the Great Grey Shrike at Edgware on foot, a nice couple of miles walk each way - Sunday morning. Elusive but showed well at distance (took bins and bridge camera only). Fieldfare and Redwing flocked and a Sparrowhawk enjoyed spooking them. A male Bullfinch brightened up a dull damp morning. A couple of photos from the weekend below, more photos at 'Latest UK Bird Photos'.